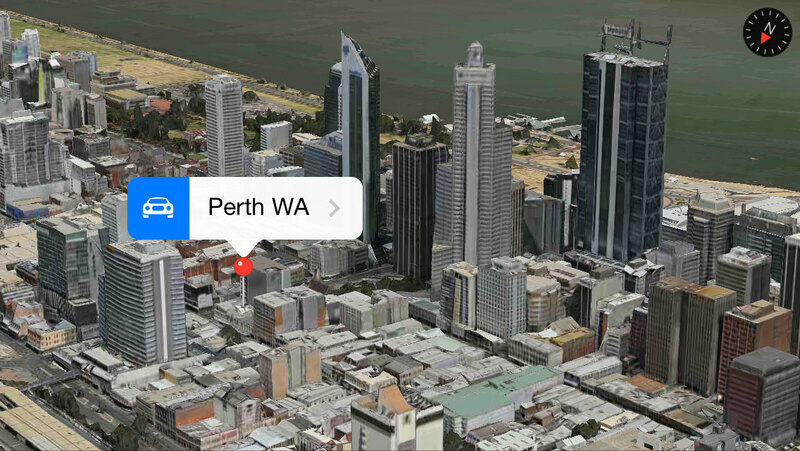 MacPrime.ch notes that Apple has recently added three new locations to their Maps Flyover feature found in iOS. The new locations include Perth (Australia), Saint-Tropez (France) and Cordoba (Spain). The 3D flyover features was introduced in iOS 6 and based on the technology of C3 Technologies which was acquired by Apple in 2011. Apple has been slowly expanding coverage since its launch and maintains a list of 3D-enabled locations on their website. would rather we got updated maps before bothering with 3d views even if it is really cool. Agreed. These 3D maps look like the sun melted everything in its path (read: terrible) at a close enough distance, so they're useless beyond a quick virtual tour of a city. If you're seeing enough distortion (after the first moments during loading) that Flyover isn't useful, then your experience is far different from mine. It's incredibly useful to me, seeing the shape of a building and it's surrounding approaches. Great for planning parking and being able to know in advance what you're looking for. I always liked Google Street View for occasional uses like that, getting a feel for the surroundings of a new distination (what parking might be easiest, how tall the building is, etc.). I always assumed Flyover would be a mediocre second-best for that kind of thing, cool though it may be. In reality, I find I launch Google Steet View about twice a year now (and am often disappointed by massive blurriness and lens flares when I try it). Whereas I use Flyover more than I ever used to use Street View. They both show the "real" shape of the roads and buildings in a way a flat aerial photo can't. Street View in theory can show smaller signs than Flyover—but in reality is usually too blurry or distorted for that. Street View is eye-level while Flyover is up above the street—but I have zero problem recognizing something just because of that angle difference. In fact, an elevated view lets me see further—I find myself wishing that Street View would let me pop 40 feet in the air too. And Flyover--IF your city has it--is SO MUCH EASIER TO USE. In Street View imaging roaming around all sides of a 1-block building to see what the different entrances are. Tap... pan awakwardly... load... tap... jump another 20 feet... it takes FOREVER and has no smooth motion. It's a sluggish, messy slideshow. Flyover is fast, smooth, and truly 3D. It shows depth and scale in a way Streetview can't, and you can roam the block in seconds, spinning around the building using the SAME map controls you use for normal 2D viewing. It's not really a separate mode. Awesome. Interesting. My experience has been pretty much the opposite. I've only used Flyover to show someone who doesn't have an iOS device what Flyover is about. It's neat for about 10 seconds. If I could fly, Flyover would be much more useful. From a practical usage standpoint, I much prefer Google Street View. GSV shows me what to expect as I'm driving or walking to a destination. That's what I want because that's how I get to where I'm going. To top it off, I've already noticed GSV images getting updated two or three times in the last three or four years. They're doing a heck of a lot of driving around; and they are now going over areas they've already covered to update their imagery. Any way you slice it, that's impressive. I love Apple and Apple products in general; but in the mapping department, they're way behind Google, in my opinion. Well hopefully they got the right Perth - the one on the west coast, not the tiny town in Tasmania. We have a new subdivision going up. Homes started being built there probably back in September and there are probably 100 homes built now. Apple maps do not show anything there. Google maps are fully updated and show all the new homes and streets. I realize this is not in the areas mentioned in the OP but Apple maps are just bad. Over here in Tokyo, the road that's outside my place has been here for at least 60 years. Except in Apple Maps. At this rate, the new buildings they're finishing up across the street won't show up in Apple Maps before the beginning of the 22nd century. They both show the "real" shape of the roads and buildings in a way a flat aerial photo can't. Street View in theory can show smaller signs than Flyoverbut in reality is usually too blurry or distorted for that. Street View is eye-level while Flyover is up above the streetbut I have zero problem recognizing something just because of that angle difference. In fact, an elevated view lets me see furtherI find myself wishing that Street View would let me pop 40 feet in the air too. I'm seeing lots of minor improvements to Apple Maps in general, but I still don't get the point of 3D maps since they don't do me any good. I wish they had put effort into a Street-view type service instead because these days I find myself using Apple Maps more than Google Maps (really don't like the new Gmaps interface). I wish Apple would expend more effort improving the Maps POIs, and the quality of the maps in general. 3D flyovers are "nice" and all, but not something that really improves my everyday life. Better Maps, on the other hand, would.